You don't have to be Al Gore to believe solar power is a good thing. But try telling that to Lynn DeMuth's homeowners association. DeMuth, a project director at the University of Phoenix, lives on a quiet Chandler street lined with stucco and Spanish tile. She says that she and her husband had always thought about getting solar panels for their home. And why not? This is one the few places in the country where solar power isn't just a tree-hugger's fantasy — with our hot, sunny weather, solar panels make sense. But startup costs are steep. Even with incentives from the government and utility companies, installation of a solar energy system can cost well over $10,000, an investment that can take 10 years to pay for itself in lower monthly bills. So credit DeMuth and her husband for deciding, finally, to take the solar plunge. "We knew people who'd done it, and they had a really good experience," DeMuth says. "So we said, 'Let's just do it.' "
Then came from the letter from their homeowners association. Their request to install the panels had been denied. The HOA's letter helpfully added that if DeMuth changed her request, and agreed to install the panels below the fence line, they might be okay. Yeah, solar panels work really well in the shade. When I first heard about DeMuth's dilemma, I was stunned. But Michael Neary, who runs a solar company here and also serves as president of the Arizona Solar Energy Industries Association, tells me that homeowner associations issue edicts like that all the time. They'll say that panels can be installed only if they're the same color as the roof — when only dark panels absorb enough sunlight to make the project worthwhile. Or they'll make the homeowners remove some of their Spanish tile, to nestle the system lower onto the roof rather than resting it on top. That process can add more than $1,000 to a project's cost, Neary says. Sure, in some instances, a local crank may notice a set of unsightly panels and complain. More likely, though, the earnest bureaucrats who get stuck running groups like this are just trying to be proactive. What makes this so crazy, though, is that HOAs like Lynn DeMuth's are actually in violation of the law. Neary points me to a 1980 Arizona statute that forbids HOAs from any action that "effectively prohibits" installation of solar devices. "By reading the law, you'd think it's very clear," Neary says. I've read it, and I agree. Requiring panels to stay below the fence line, for example, is an effective prohibition and, therefore, an illegal one. Panels placed that low, in a shady yard, simply aren't going to work. And after Garden Lakes lost the jury trial, a group of associations actually banded together to appeal the ruling. Despite the precedent set by the Garden Lakes couples, DeMuth's case is clear evidence that those sorts of HOA shenanigans haven't stopped. And the more I think about it, why should they? Homeowners associations here have banned people from putting up flagpoles. And from using native desert plants instead of the landscaping flavor of the month. Or even putting up a clothesline. In one egregious instance, detailed in Joel Garreau's book Edge City, covenants for Charles Keating's Estrella development banned "pornographic" books and magazines from its residents' bedrooms. Garreau, a Washington Post reporter, came to Phoenix to research HOAs — that's how bad they are here. But it isn't just Arizona. When I was living in Ohio, I had the misfortune to own a condo in an HOA dominated by busybody senior citizens. They actually passed a law to ban people from feeding the squirrels. And then, as I watched aghast at the single meeting I attended, they very nearly passed a law to ban children from playing on the sidewalks and tennis court — a liability issue, the oldsters argued. Keep in mind, no one had ever sued the association over injuries on the tennis courts, much less the frickin' sidewalks. My HOA was merely trying to be proactive. Show me a proactive government, and I'll show you a fast sprint toward the hills. And HOAs are even worse than the usual meddling politicians, for two reasons. First, my experience with a HOA wasn't unusual — most members seldom bother with meetings, much less pay attention to elections. So you get a minority group running roughshod over what's probably the majority opinion, were anyone actually paying attention. Second, as Garreau details in Edge City, HOAs aren't bound by the constitution. Take freedom of the press, for example. When you're dealing with private property, nobody has to allow newspapers to be distributed. Or freedom of speech. If you signed away all your rights to put up political signs when you bought the property, well, too bad for you. Good thing we've got the Arizona Legislature. Since homeowners associations have shown their unwillingness to follow the intent of the law that permits solar panels, State Rep. Chad Campbell, a Phoenix Democrat, introduced a bill to tighten the law in February. 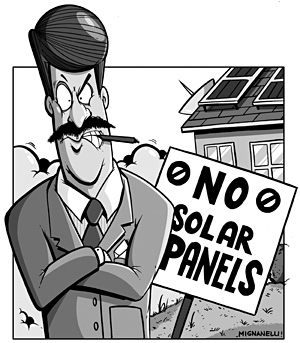 Campbell's bill makes it even more clear: HOA rules cannot impair the solar device's ability to function, or adversely affects its costs. Period. Among other things, the bill requires the court to award attorneys fees to homeowners who beat the association in court — the teeth that may be needed to stop outrages like the Garden Lakes case. The bill sailed through the House, only to nearly die in the Senate. Senator Jack Harper, a Republican from Surprise, refused to give it a committee hearing, thereby dooming it to legislative limbo. Harper tells me that he was worried because the bill didn't offer any limits on size. He was concerned, he says, after seeing the giant solar panels at Embry-Riddle, a college near Prescott — and jumped to the conclusion that HOAs could be powerless to stop residents from building similarly super-sized solar farms in their backyards. It sounds pretty silly, even if you give Harper the benefit of the doubt. As it turns out, even Harper readily admits that simply ignoring Campbell's bill wasn't the way to go. "Shame on me for not explaining the problems I had with it," he says, sounding sheepish. At any rate, Campbell's now added his solar panel provisions to another bill, one that won't have to go through Harper. This bill, I'm told, is widely expected to pass. Now, normally I'm opposed to our Legislature doing much of anything, other than passing a budget and bird-dogging various state agencies, just on sheer principle. We have enough laws in this state, and the people down at the Capitol are not my first pick to add a few more. But any law that reins in the power of homeowners associations is A-okay in my book. It's the highest and best use of government — to save us from other governments. Especially the crazy, quasi-elected ones. And if we can better harness a natural resource in the process, even better. Campbell, incidentally, says he's heard from nearly a dozen homeowners since he introduced his bill, all who've had the same experience as DeMuth. "I had no idea the attention this would get," he says. "It's an important issue. We should be leading the nation in solar power. And if someone owns property, and they're willing to spend the money, why would we try to stop them?" You can tell that Campbell's in his first year in the Legislature. The guy makes way too much sense.